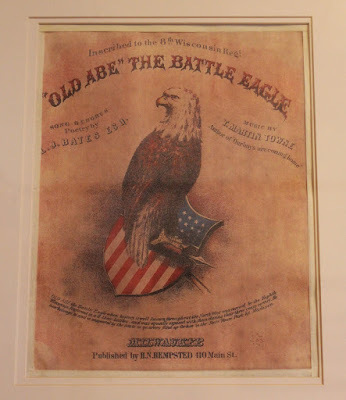 The Civil War Exhibit is located at the Chippewa County Historical Society Area History Center and Museum on the southwest corner of the intersection of Allen Street and South Prairie Street, at 123 Allen Street, Chippewa Falls, Wisconsin 54729. The exhibit was once the personal collection of a Chippewa Falls resident, who one day donated the entire collection to the Chippewa County Historical Society. The exhibit is full of treasures. These photos are of only a few of the exhibit's contents. Photograph of female eagle "Old Abe" with the 8th Wisconsin.